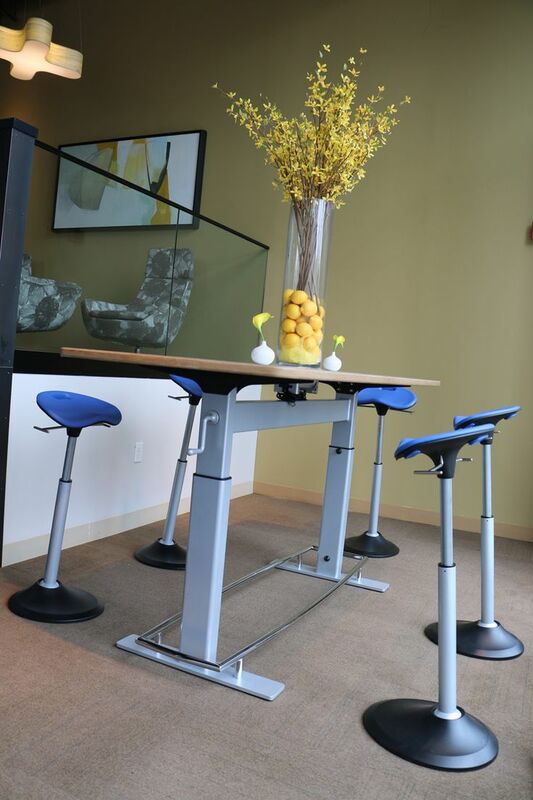 Mobis, the adjustable height, lean-into seat and perfect partner for any standing desk. Our bodies were not designed to maintain the same position for hours at a time, and Mobis is here to help. 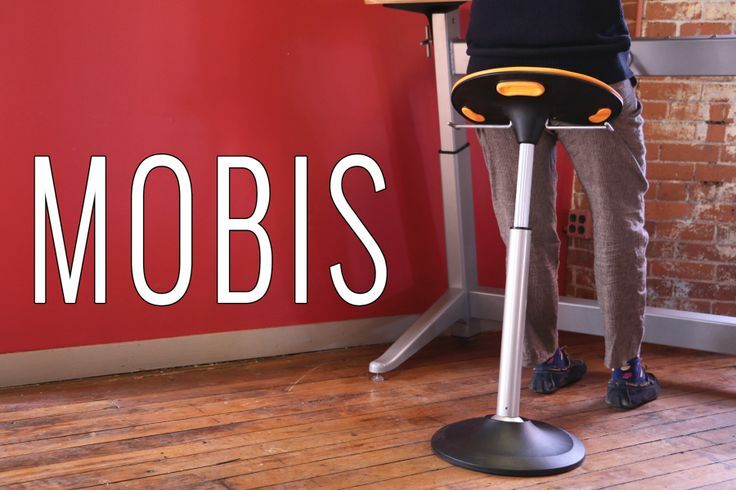 Mobis is designed to be a supported standing device. While standing, engage the pneumatic lift to raise the seat until you reach a comfortable perching height and then lean back. 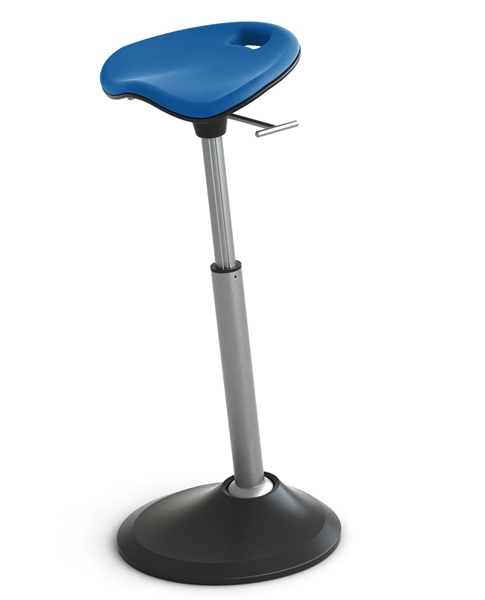 Perching at a taller seat height allows the spine to support itself in a healthy neutral position. By sitting up higher and opening up the hip angle, the pelvis is able to tilt forward and provide natural, healthy lumbar support. When using Mobis you will find your body assumes a relaxed, upright posture that keeps your major muscle groups engaged and your energy level up. Mobis' small footprint and easy mobility also makes it ideal for those with a job that require all day standing, such as cashiers and bank tellers. 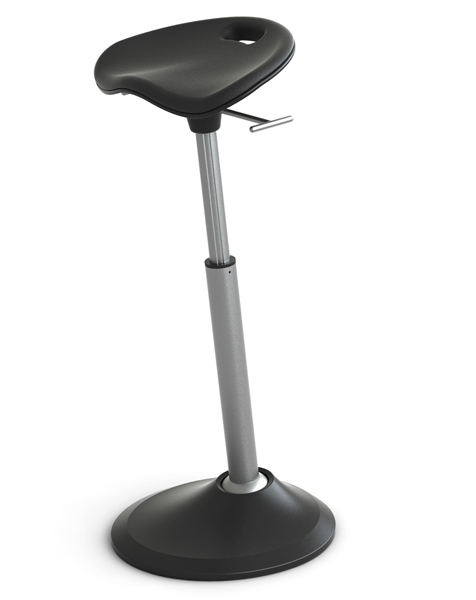 Height-adjustable design accommodates people from 4'0" to 6'8"
Contoured EVA foam cushion adds extra comfort for long periods of sitting. Seat rotates 360°, always returning to center. Leg flexes 6° in all directions. 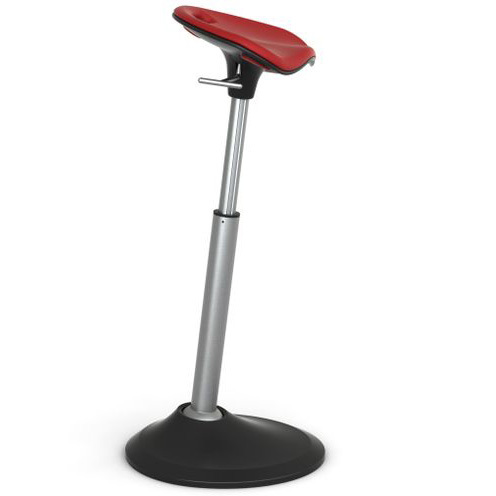 Seat height adjusts from 25" - 35"
Base Footprint measures 16" ellipse. Commercial grade components including gas piston cylinder, fiberglass-reinforced nylon, brass and high-carbon steel, and high-durometer rubber. Sourced globally, assembled in Rhode Island, USA. 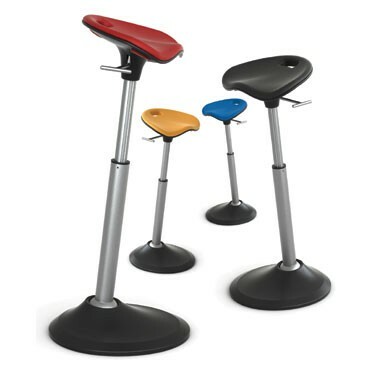 Focal Upright Furniture LLC (“Focal”) warrants that Focal™ brand products are free from defects in materials and workmanship for the life of the product, except as set forth below. This warranty is valid from the date of delivery and covers the original purchaser only. The substitution of any unauthorized non-Focal components for use in the place of Focal components. Damage caused by a carrier or due to transport. Any damage due to service, maintenance, modifications or tampering by anyone other than an authorized Focal representative. This warranty is not transferable. Products purchased from non-authorized dealers may not be warranted. Replacement parts are covered for 2 years or the balance of the original warranty, whichever is longer. 10 years: Laminate and wood veneers. 5 years: Seating – Foam and seating textiles, mechanisms, pneumatic cylinders, wheels and height adjustable mechanisms. Desks – Height-adjustable Mechanisms. 1 year: Mogo Travel Seat. Pursuant to this Limited Warranty, if a product fails under ordinary use as a result of a defect in materials or workmanship, Focal will (i) repair or, at Focal’s option, replace the affected product at no charge, or (ii) refund the purchase price for the affected product if repair or replacement is not commercially practicable or cannot be timely made. If you purchased your product used, the warranty is not transferable.